You are viewing a piece of history! 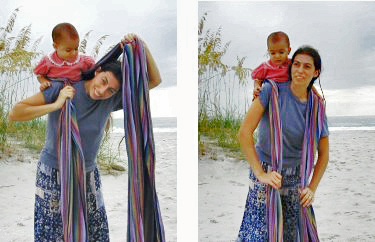 My husband photographed this tutorial with a film camera 10 years ago. The photos were scanned into the computer and the originals are long lost. 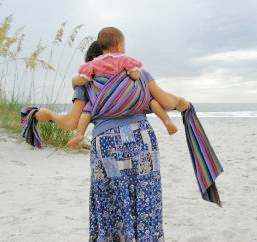 This tutorial was among the original wrapping tutorials made for the Western World at the advent of the popularity of modern babywearing! Enjoy! Step 1. 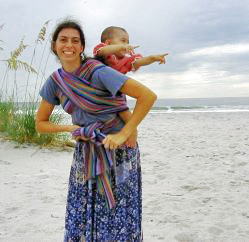 Place the center of the wrap on your baby’s back and swing baby onto your back. Step 2. 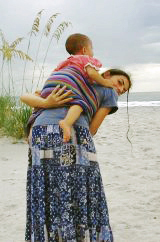 Bring one wrap end over each shoulder. Step 3. 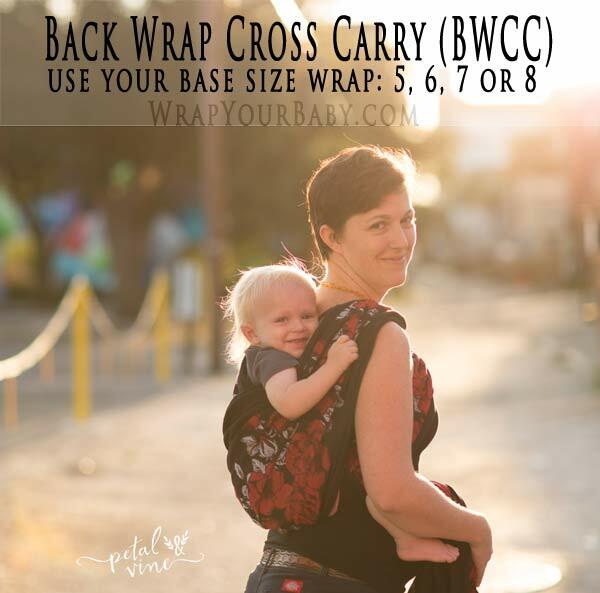 Bring each wrap end under your arm so they come straight around from the back. Step 4. 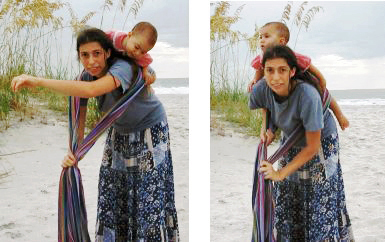 Create a seat for baby by pulling the bottom third of the wrap down under baby’s bottom and UP to baby’s knees. 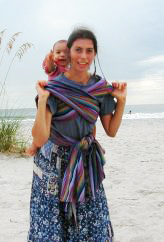 Pull the top edge of the wrap up over baby’s shoulders or to baby’s armpit for an older baby/toddler. Step 5. 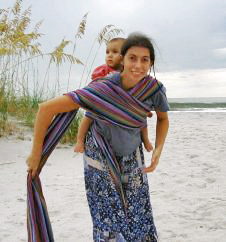 Keeping one wrap end between your knees, take the other wrap end across your body to go over the opposite shoulder. Step 6. 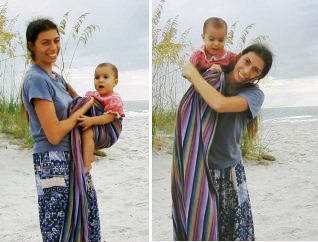 Spread the wrap over your baby by pulling the top edge up high over baby’s back and the bottom edge down to form a seat that goes from knee to knee. Step 7. 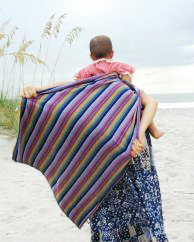 Gather the wrap, keeping it uniformly snug, and tuck the wrap under baby’s opposite leg. Step 8. 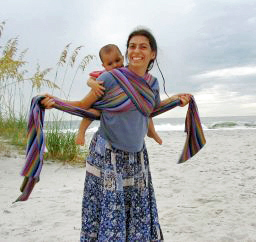 Bring the other wrap end across your body and over the opposite shoulder. Step 9. 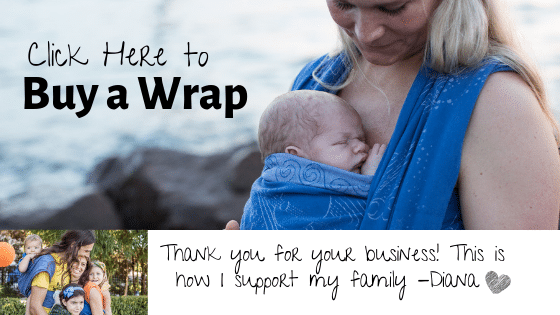 Spread the wrap across your baby’s back just like you did with the last one. 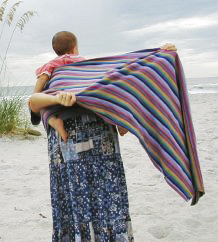 Step 10: Gather and tuck the wrap under baby’s leg (make sure the bottom edge of the wrap goes from knee to knee and the top edge is high across baby’s back). Step 11. 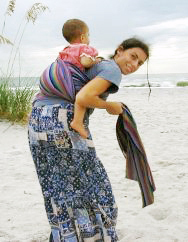 Take any slack out of the whole carry by hopping up (so your baby’s weight comes off the wrap) and tug on both ends of the wrap at the same time. Step 12. Tie at the waist and you’re done! 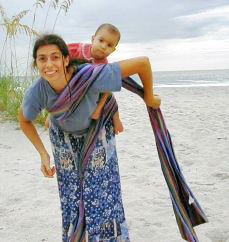 Pull the wrap to a comfortable place on your shoulders so it won’t pull on your neck.